So I as you know I’ve been searching for a job ever since graduation in the spring. This is the absolute worst time time to be a recent graduate, but this isn’t the first time I’ve been searching fruitlessly for work. The summer between my freshman and sophomore college years I applied everywhere including the now defunct Circuit City. 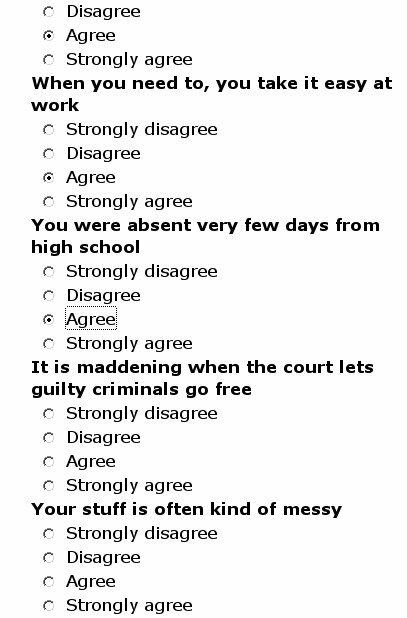 On their 20+ page online application/exam I was asked these questions. I screen capped this back in 2006 well before I had a blog, but I knew it would be worth something someday. It is maddening when the court lets guilty criminals go free. Lets run down the list. Is my stuff messy? Sure. Can I take it easy? Yeah. Do I duck school? Not really. Do I find flaws in the criminal justice maddening? That's taking it a bit too far. Circuit City, I'm glad you failed. I found your still being in operation maddening. For the record I find innocent people being convicted to be far more troublesome, but I wouldn’t ever call it maddening.